If you're a heavy workload professional searching for an SSD with uncompromising power and performance, look no further. The next-generation Samsung 960 PRO delivers exceptional performance for professionals. The new Samsung SSD 960 PRO is the 2nd generation NVMe SSD for Samsung's client PC SSD. As such, the Samsung SSD 960 PRO is designed for professionals and enthusiasts that are seeking next generation performance and endurance. 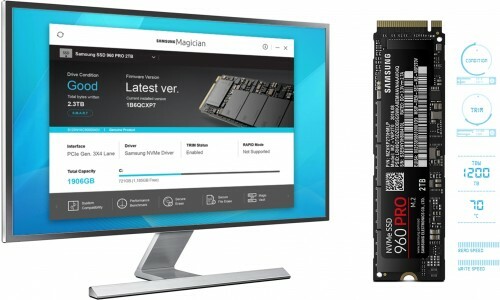 It offers the ultimate in performance, breaks storage limits for the m.2 form factor and banks on its solid reliability to offer customers the most advanced SSD technology currently available for client PCs Samsung's unique and innovative V-NAND flash memory architecture is a breakthrough in overcoming the density limitations, while improving on the performance and endurance of today’s conventional planar NAND architecture. V-NAND is fabricated by stacking layers vertically over one another rather than decreasing the cells dimensions and trying to fit itself onto a fixed horizontal space resulting in higher density and better performance utilising a smaller footprint. This cutting-edge V-NAND-based NVMe SSD supports PCI Express Gen 3 x4 lanes, providing a higher bandwidth and lower latency to process even more massive amounts of data than our previous generation NVMe SSD. Building on the PCIe Gen. 3.0 x 4 lane interface and support of the NVMe 1.2 protocol, the 960 PRO, in combination with our advanced 3rd generation V-NAND and newly developed Polaris controller is able to offer sequential read performance of 3,500MB/s and sequential write speeds of 2,100MB/s. The 960 PRO achieves random performance of up to 440,000IOPS and 360,000 IOPS for read and write operations respectively for industry leading performance across key metrics. Thanks to the advanced packaging technology, the use of a four-landing-design and the integration of the DRAM and Polaris Controller in a Package-on-Package solution the 960 PRO becomes the world's first client PC SSD in the standard 2280 m.2 form factor to be able to pack 2TB of capacity. For greater consumer choice, the 960 PRO is also available in 1TB and 512GB versions. The 960 PRO, thanks to the use of 3rd generation V-NAND Flash technology, offers users not only improved performance and higher density, but also solid reliability. The 960 PRO's improved thermal solutions, advanced hardware encryption and enhanced endurance enable users to confidently entrust their data to their SSD. In most cases of data transfers, heavy workloads can induce heat and result in high temperatures. Once temperatures reach a threshold, memory performance may be adversely affected. As the leader in SSD memory solutions, the 960 PRO adopts a new heat spreader for dissipating heat more efficiently during heavy workload use. It achieves this by integrating a thin copper film and because copper is a great heat conductor it helps to shed heat faster than would be possible without the label. Furthermore, the new 4 landing design also improves thermal characteristics, as it can reduce heat generation per unit area. The 960 PRO provides the same data encryption features as other Samsung SATA SSDs. Self-Encrypting Drive (SED) security technology will help keep data safe at all times. It includes an AES 256-bit hardware based encryption engine to ensure that your personal files remain secure. Being hardware-based, the encryption engine secures your data without performance degradation that you may experience with a software-based encryption. Also, the 960PRO is compliant with advanced security management solutions (TCG Opal). When users spend money on an SSD, first of all, they consider value for money and want an SSD that will last. 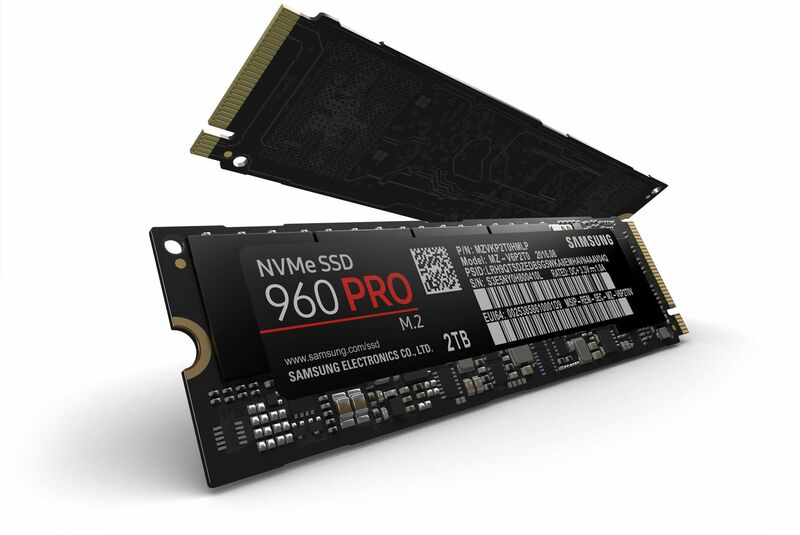 Starting with the 850 PRO, Samsung's 1st V-NAND SATA SSD, Samsung's V-NAND changed the paradigm. Now in its 3rd generation, the 960 PRO boasts Total Bytes Written of up to 1.2 Petabytes for the 2TB model. With the newly upgraded Magician advanced software solution, you can manage, monitor and maintain your 960 PRO like an IT professional. Magician provides personalised firmware checking and additional functions tailored for individual user's drives. It even updates the firmware automatically to make sure that the drive's performance stays up to date. Windows 7 Users: Please note that Windows 7 users may experience difficulties installing a fresh copy of Windows 7 directly onto a NVMe M.2 SSD. This is due to Windows 7 not having a driver for the M.2 drive. Microsoft have provided a hotfix and instruction to help install Windows 7 on a NVMe drive. Please click this link for further information. Installed this in a Asus Prime X299-A PC, very easy to fit, Samsung driver and Data Migration worked without any issues, it cloned the C drive to the 960 pro okay. All applications still ran okay apart from IK media T racks which required a new download I guess due a license loss during the process or the way I had it configured previously. Overall very easy and now superfast load times. Regards Multitrack Sound Services.